Turns out this guy, Blaine Gabbert from Missouri, is pretty good. A lot of folks think he’s the best QB coming up in the NFL draft. Can’t imagine anybody passing up Cam Newton to take this guy though. 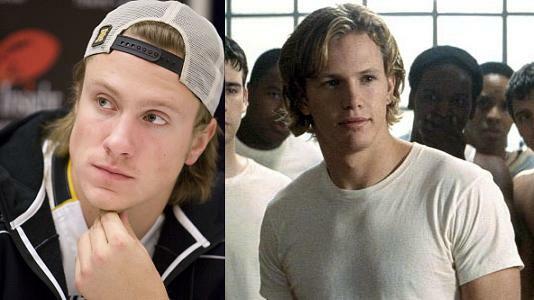 Either way, I’m not at all convinced he’s not Sunshine from Remember the Titans. Speaking of Sunshine…when they’re telling Mama jokes in the locker room, then they start singing “Ain’t No Mountain High Enough”, and Sunshine kisses Bertier… that’s just movie gold, I’m not even kidding. If you haven’t seen it in awhile…give a revisit. This entry was posted in College Football, Football, Movies, NFL and tagged Ain't No Mountain High Enough, Auburn, Blaine Gabbert, Cam Newton, Missouri, NFL draft, Remember the Titans, Sunshine. Bookmark the permalink.